What are Micro peptides? – Bio-Synthesis, Inc.
Home › Bioanalysis › What are Micro peptides? Do noncoding RNAs (ncRNAs) code for micro peptides? Yes, apparently this appears to be the case! In protein synthesis RNA acts as a template for cellular proteins and as ribosomal and transfer RNA (tRNA). However, a large proportion of eukaryotic transcripts are considered to be ncRNAs. Many of them contain only short open reading frames (sORFs). This was one reason why these RNAs were named ncRNAs. Now however, it appears that ncRNA and long ncRNAs (lncRNAs) may code for something after all. There is evidence that some of these ncRNAs have regions that encode short polypeptides. If these regions are translated the short peptides may have physiological functions. Biochemist have known for many years that short polypeptides can have important physiological roles. Processing of larger “polypeptides” by cleaving them into shorter peptides is a well established biochemical phenomena to yield functional extracellular circulating molecules. A famous example is the proopiomelanocortin protein (POMC). The large POMC molecule is processed to yield several important biologically active peptides. POMC can be cleaved enzymatically into the N-Terminal Peptide of Proopiomelanocortin (NPP, or pro-γ-MSH), γ-Melanotropin (γ-MSH), Corticotropin (Adrenocorticotropic Hormone, or ACTH), α-Melanotropin (α-Melanocyte-Stimulating Hormone, or α-MSH), Corticotropin-like Intermediate Peptide (CLIP), β-Lipotropin (β-LPH), Lipotropin Gamma (γ-LPH), β-Melanotropin (β-MSH), β-Endorphin, and [Met]Enkephalin. As this example shows, bioactive small peptides are derived from precursor proteins or peptides that contain signal sequences at their N-terminal ends. The precursor molecules undergo modification and proteolysis through a secretory pathway. Small peptides encoded in short open reading frames (sORF) lack signaling sequences and are released into the cytoplasm. This may indicate that these peptides have different functions. However, short peptides that act intracellularly are at the moment thought to be much rarer. One research group in England (Galindo et al. 2007) and a second one in Japan (Kondo et al., 2007) have recently studied the underlying cause of mutations in a gene called pri (for “polished rice”) or tarsal-less (tal) in Drosophila or milli-pattes (mlpt) in Tribolium and published their results in the journals PLoS Biology and Science. This gene is responsible for defects found in legs, embryonic epidermis, and the respiratory system of pri mutants. Mutations in this gene are known to cause a defect in bristle formation on the fly head and in the formation of a hook-like projection on the leg. The 1549 nucleotides long pri RNA transcript was at first thought not to encode proteins at all and it was believed to be an lncRNA. However, the results of the two research groups indicate that peptides of 11 to 32 amino acids encoded by the pri sORF gene control epidermal differentiation in Drosophila by modifying the transcription factor Shaven baby (Svb). The researcher’s results suggest that the peptides trigger the amino-terminal truncation of the Svb protein. This converts the Svb protein from a repressor to an activator. The results indicate that pri sORF peptides provide a strict temporal control to the transcriptional program of epidermal morphogenesis. The researchers found that pri encodes for short peptides. The research groups identified at least five scattered coding regions for micro peptides. Each sequence begins with a translation start codon and ends with a translation stop codon. 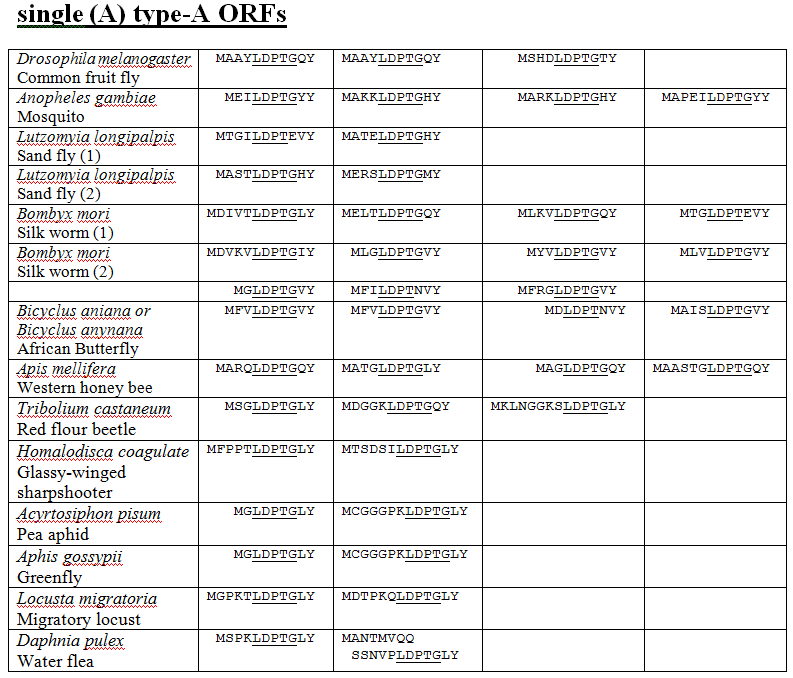 Furthermore, these peptide-coding regions are conserved in a wide variety of insects. The figure below illustrates how the pri peptides may trigger the epidermal differentiation events in insects. 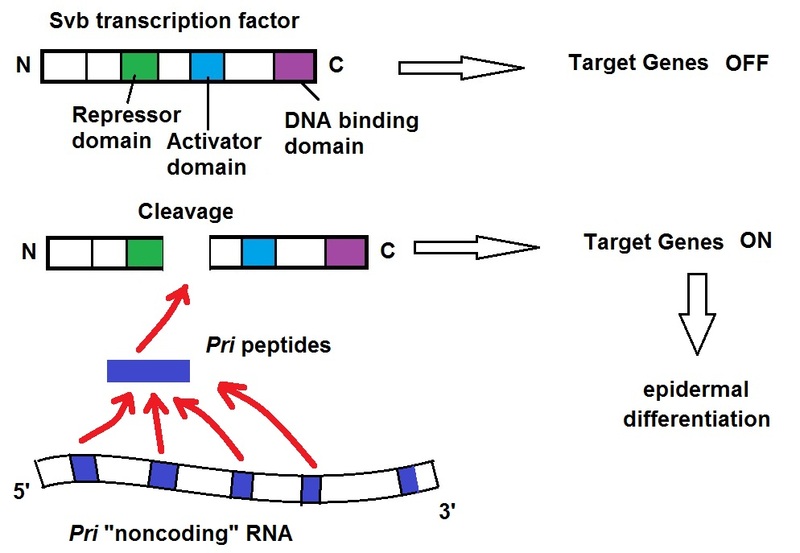 The micropeptides, called small pri peptides, are expressed from the lncRNA pri and direct the proteolytic cleavage of the transcription factor Svb. They appear to act as on and off switches during insect development as illustrated in the above figure. These findings suggest that other RNA, they may be lncRNA or mRNAs with short open reading frames, may also generate peptides that direct cleavage or other modifications of target proteins. The figure below shows the tal transcript in Drosophila and the LP10384 cDNA sequence with conceptual ORFs. The figure above shows the tal transcript found in Drosophila. The LP10384 cDNA sequence with conceptual ORFs is illustrated as well. The bold red letters indicate conserved domains within the type-A peptides (Source: Galindo et al 2007). Micro-peptide research is still in its infancy. It may well be that micro-peptides similar to microRNAs are a new class of gene products that have been overlooked in the past. Biosynthesis Incorporated has 28 years experience in the synthesis of synthetic peptides, DNA and RNA oligonucleotides as well as in the analysis of these molecules and has the tools to help scientists accelerate their research. T. Kondo, S. Plaza, J. Zanet, E. Benrabah, P. Valenti, Y. Hashimoto, S. Kobayashi, F. Payre3, Y. Kageyama; Small Peptides Switch the Transcriptional Activity of Shavenbaby During Drosophila Embryogenesis Science 16 July 2010: Vol. 329 no. 5989 pp. 336-339. DOI: 10.1126/science.1188158. Miriam I. Rosenberg and Claude Desplan; Hiding in Plain Sight. Science. 2010 July 16; 329(5989): 284–285. doi: 10.1126/science.1192769. PMCID: PMC3033778. NIHMSID: NIHMS263940. Hashimoto Y, Kondo T, Kageyama Y.; Lilliputians get into the limelight: novel class of small peptide genes in morphogenesis. Dev Growth Differ. 2008 Jun;50 Suppl 1:S269-76. doi: 10.1111/j.1440-169X.2008.00994.x. Epub 2008 May 6. ‹ What are MicroRNAs and what do they do? This article has truly peaked my interest. I’m going to book mark your website and keep checking for new information about once per week. I subscribed to your RSS feed as well. surprising you aren’t more popular because you definitely possess the gift.